This light cucumber Greek salad is the perfect meatless summer dish. Trust me, you’re going to want to make this all summer long! Fresh cucumber, tomatoes, bell pepper, olives, red onion, oregano, lemon juice, olive oil, and fresh feta – it’s filling, high in fiber and protein, perfect for lunch or dinner! 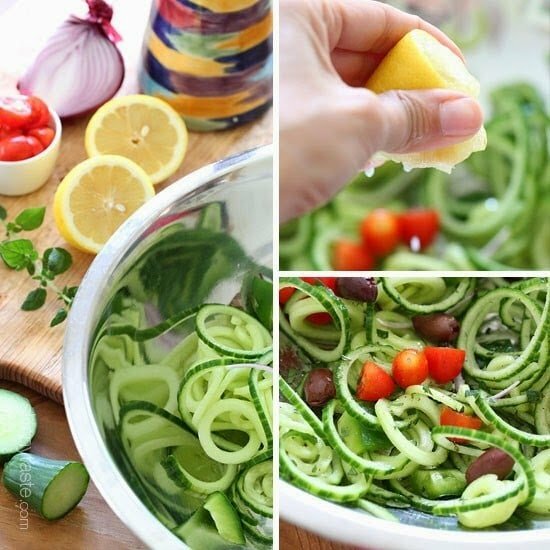 1.Spiralize the cucumbers using the chipper blade on the Paderno spiralizer. Cut the strands into smaller pieces, about 5-6 inches long so it’s easier to eat. If you don’t have a spiralizer, you can just dice the cucumbers with a knife into small cubes. 2.Place the cucumber in a large work bowl along with the bell pepper, tomatoes, olives and red onion. Squeeze half of the lemon over it, drizzle with half of the olive oil and toss with fresh oregano, salt and pepper. Place on a plate, top with a slice of feta and finish with remaining olive oil.